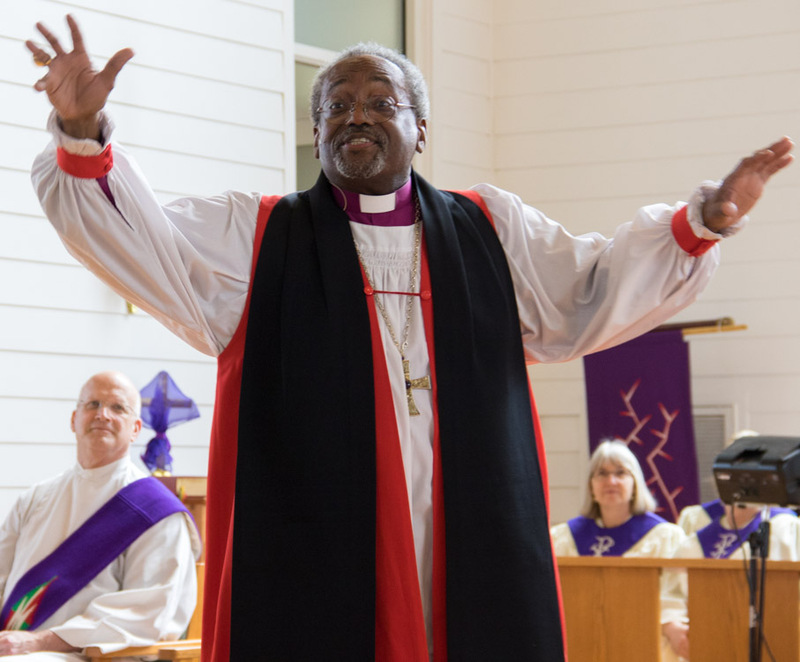 [Episcopal News Service – Corpus Christi, Texas] When the Rev. 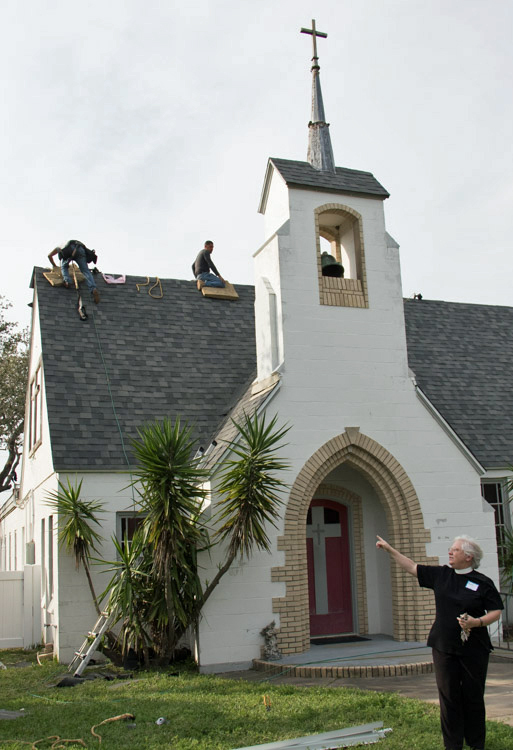 Jim Friedel, rector of St. Peter’s Episcopal Church in Rockport, Texas, first visited his church after Hurricane Harvey smashed its Category 4 force into the coastal community, he crawled across the floor of the nave to check for water damage. Finding none, Friedel was relieved that monster storm had spared his church from any serious damage. When he returned a few days later, his shoes went squish, squish. By then, rainwater that had been pressured sprayed around the windows, sills, siding and bell tower by the force of 130-mile-an-hour winds had seeped down the inside of the walls, through the insulation and onto the floor. Soon, the church was humming as six generators powered more than 60 dehumidifiers and blowers to dry out the sanctuary. The damage, it turned out, would require extensive repairs. This was the kind of story that Presiding Bishop Michael Curry heard repeatedly on Feb. 28 from clergy and laypeople as he toured the Coastal Bend region of South Texas in the Diocese of West Texas. Ten Episcopal churches and the diocese’s Mustang Island Conference Center sustained damage when Hurricane Harvey pounded the barrier islands and coast on Aug. 25, 2017, for a dozen hours with massive winds and rain. When Harvey finally left, it crept up the Gulf Coast and settled over the Houston area and dumped another 30 inches of rain, causing historic flooding. 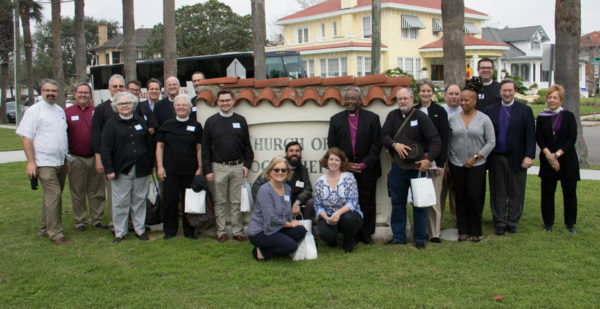 Curry visited the Houston region in the Diocese of Texas in January. By the time Harvey had finished rampaging the area from Corpus Christi to Houston, 41 Texas counties had been declared federal disaster areas, including 15 in the Diocese of West Texas alone. Harvey dumped some 25 inches of rain on the Coastal Bend and spawned an estimated 200 tornadoes. Recovery work may take up to a decade. Curry’s visit focused on Port Aransas and Rockport, two of the hardest hit communities in the Coastal Bend. 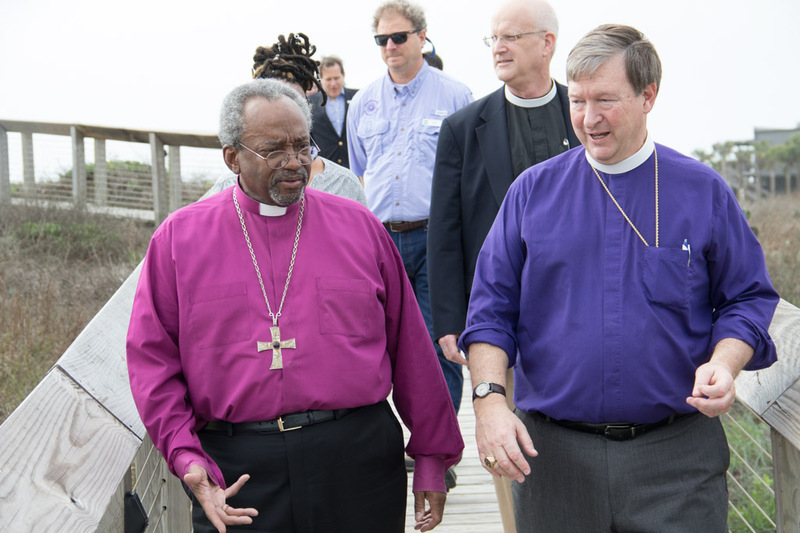 Local clergy and lay leaders whose churches and communities were damaged by the storm joined the visitors, who included the presiding bishop, with Sharon Jones, his executive coordinator; the Rev. Deacon Geoffrey T. Smith, chief operating officer of the Episcopal Church; Neel Lane, chair of Episcopal Relief & Development’s board of directors; Josephine Hicks, the organization’s vice president for programs; the Rt. Rev. David Reed, bishop of the Diocese of West Texas; the Rt. Rev. Jennifer Brooke-Davidson, diocesan bishop suffragan; and Jennifer S.T. Wickham, the diocese’s deputy for disaster recovery. Both Trinity by the Sea in Port Aransas and St. Peter’s in Rockport had reasons to look forward to 2017 in the months before Hurricane Harvey struck. St. Peter’s had celebrated its first Christmas in its new building only eight months earlier. Trinity by the Sea was designated a parish at the February 2017 Diocesan Council and planned to launch a capital campaign in September to undertake campus improvements. Although there is no seminary course in hurricane recovery, Curry heard multiple stories about how clergy who had never experienced a disaster like Harvey helped lead their parishioners in assisting their neighbors, communities and own churches in relief and recovery. “The clergy are wise enough to learn how to pivot,” Curry said. In Rockport, entire city blocks resembled a war zone seen on the evening news. Even months past the storm, Curry’s tour bus passed through neighborhoods where downed trees still remained on rooftops, fences lay crumbled, and mattresses, sign posts, sheet metal and other unidentifiable debris littered the roadsides. He saw holes blown through brick walls, blue tarps covering damaged roofs, once-flourishing businesses boarded up and a mile-long mound of storm debris stacked along the median of Texas Highway 35 waiting to be hauled off. Despite the damage it sustained, parishioners at St. Peter’s jumped in to assist in recovery and outreach efforts in Rockport by providing hot meals, clothing and other resources to help those in need. The water damage to the nave forced Friedel to conduct church services outdoors, before moving inside to the parish hall. By mid-December, though, the nave was repaired and the congregation celebrated a second Christmas in its new home. 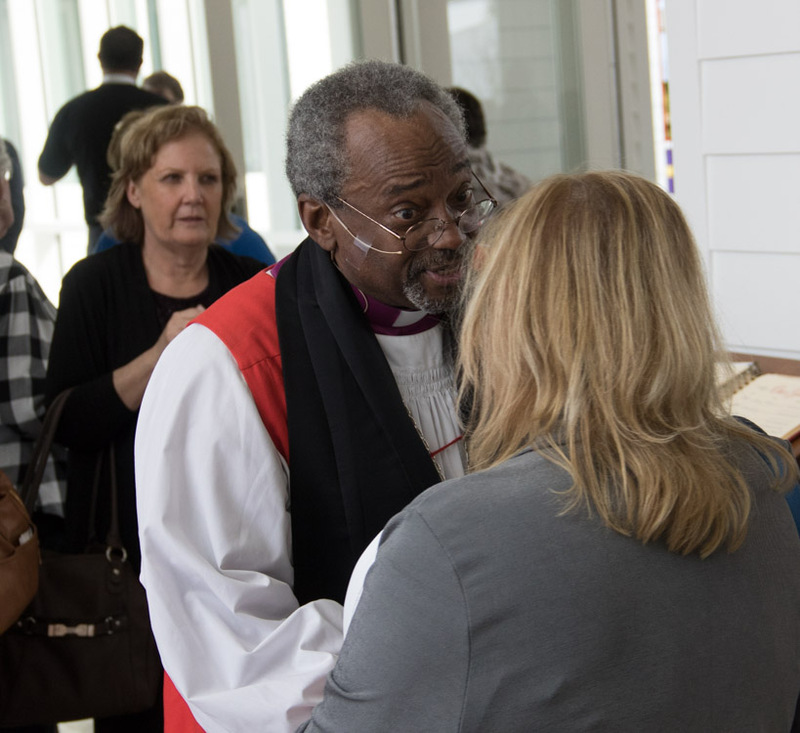 During an impassioned sermon at St. Peter’s, Curry praised the work of the Episcopalians and encouraged clergy and parishioners to continue helping those in need in their communities. Referring to the Gospel, Curry told the 250 attending the Holy Eucharist service that Christ’s message was that caring for those in need is caring for Christ. “The whole point of the Bible” is to be reconciled to God, he said, and Jesus showed the way. “Jesus came to show us how to love each other,” he said. Across the intercoastal waterway from Rockport, Curry visited Trinity by the Sea, where he sat in on a chapel class for the children at the church’s day care and school and sang “Jesus Loves Me” along with them. After Harvey hit, Trinity put its capital campaign on hold, opened its parish hall as the first supply center in Port Aransas, turned its thrift shop into a community library and deployed volunteers for cleanup efforts. Daily Morning Prayer services were initiated and broadcast over Facebook, the church doors were opened to community (and to assist in drying), and on the date set for the kick-off for the capital campaign, a candlelight Holy Eucharist was celebrated instead in the darkened and damaged church. Trinity made repairing its school building a priority and was able to open it by Oct. 16, the same date when the public schools reopened. During the time before classes resumed, Trinity’s teachers were kept on the payroll, despite the lack of tuition income. Trinity also helped sponsor the Homes for Displaced Marlins, an initiative named for the school mascot in Port Aransas, to provide temporary housing for displaced families in Port Aransas, enabling them to remain in the community and for the children to attend local schools. To date, Homes for Displaced Marlins has raised $1 million to purchase recreational vehicles to give to displaced residents, either as temporary or permanent housing. Walter Sohl, who organized the initiative, told Curry that many of those who lost their homes were low-income residents whose work is vital to supporting the service sector in an area that relies heavily on tourists and seasonal homeowners for economic vitality. Derkits also told of his own personal spiritual transformation that he experienced in the aftermath of Harvey. Clergy shared stories about the outpouring of volunteer support and financial support they received from churches throughout the diocese and nation. The support ranged from sending volunteers to help with cleanup efforts to simply calling parishioners to make sure they were OK.
For example, Trinity has received donations to help with its recovery, including a pledge of $3,500 from St. Bartholomew’s Church in Corpus Christi and a $20,000 grant from the Harvey Relief Fund through Christ Church Cathedral in Houston. St. Mark’s in Houston paid $7,000 toward its diocesan assessment. The Rev. Beverly Patterson, rector for three small churches in the Coastal Bend, said financial assistance continues to remain a problem for her churches. The congregations are predominately elderly and are located in lower-income areas that don’t benefit from the summer influx of tourists and seasonal homeowners. “We’re still knee-deep in the middle of repairs,” she said. In addition to touring the damage inflicted by Harvey, Curry also attended a community meeting the evening of Feb. 27 at the Cavalry First Baptist Church in the New Addition neighborhood of west Corpus Christi. Before Harvey hit, the Diocese of West Texas and local Episcopal congregations had begun utilizing the Asset-Based Community Development (ABCD) model to empower neighborhood residents to revitalize their own neighborhoods and transform them into abundant communities. ABCD is an approach to community development initiated in the 1980s that is being championed by Episcopal Relief & Development. It recognizes that sustainable change only comes from within each person and each community and utilizes individual, corporate, personal and physical gifts to transform marginalized neighborhoods into abundant communities. Although the devastation along the coast received the overwhelming amount of media coverage, this socially and economically marginalized neighborhood in Corpus Christi consisting primarily of black and Hispanic families also sustained damage. Homeowners applied to the Federal Emergency Management Agency and the Red Cross for assistance but received very little support. Moreover, many homeowners with insurance could not even afford to pay their deductibles. Bishop Charles S. Richardson Sr., pastor of Cavalry, said Harvey had a “negative impact but not as bad as other neighborhoods.” The upside, he said, is that it “brought people together. Sometimes it takes a storm to bring people together” by cleaning up debris, delivering water and providing gift cards to purchase food. In encouraging the residents to continue to work together, Curry told the meeting that he had served a church in Baltimore where drug abuse was a major problem in the neighborhood. Working alone, the church was unable to address the issue, but when it combined efforts with other churches in the community, it was able to see results. — Mike Patterson is a freelance writer based in San Antonio, Texas. He can be reached at rmp231@gmail.com.